We often hear terms like “stocks” or “stock market” and they seem to lure us in. But if you think about it, there is not much you know about these terms perhaps movies starring Will Smith (Chris Gardner, in off-screen) from The Pursuit of Happyness got selected in a brokerage firm. Or maybe you saw Leonardo DiCaprio in The Wolf of Wall Street, who started off as a stockbroker in a Wall Street brokerage firm. The world of stock-market surely is enticing but how much do we really know of it? The answer to this question is mostly along the line of “Not much” or “Maybe a little”. Right? So let us find out what the hype is about? Stocks, definitely, are worth learning about and can earn you a handsome profit if you invest in the right sector at the right moment. This all can be done by learning to read Stock Market Charts, but before that let’s take a look at what a stock is. 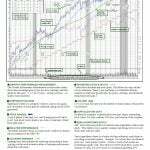 A stock, as most of us know, is a partial ownership in a public company. If you buy a stock in a company then depending on the number of stocks you buy, you become co-owner of that company. This means if the company’s is at loss, the value of your stock goes down and if it is at profit, you get your share of the profit as well. So far, it looks simple enough, but it gets a bit complicated. So, how should anyone choose the right company to invest in from the 5,000 public companies on the NYSE and NASDAQ? Or, how to decide if buying stocks in a certain company is going to make you profit? The answer to this is – Stock Market Charts. 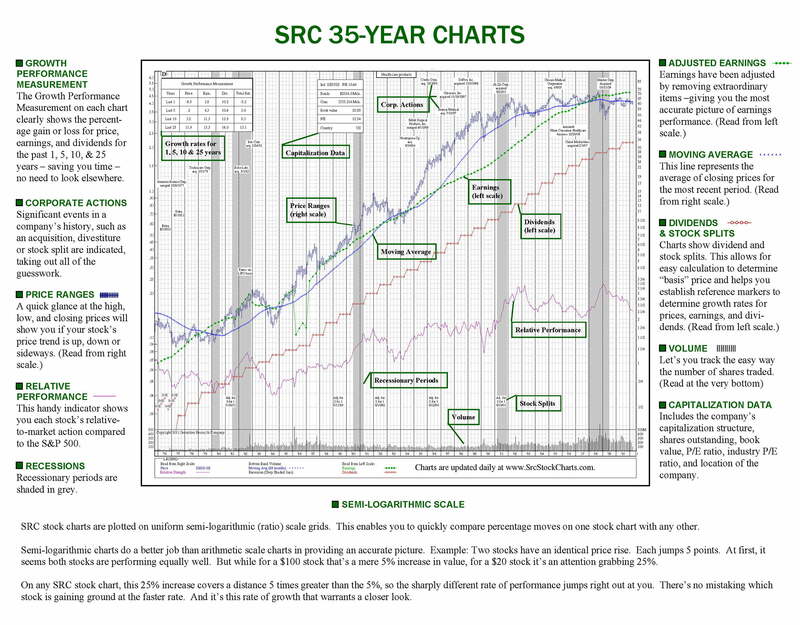 Stock Market Charts are, basically, like a history book of the company you are planning to invest in. 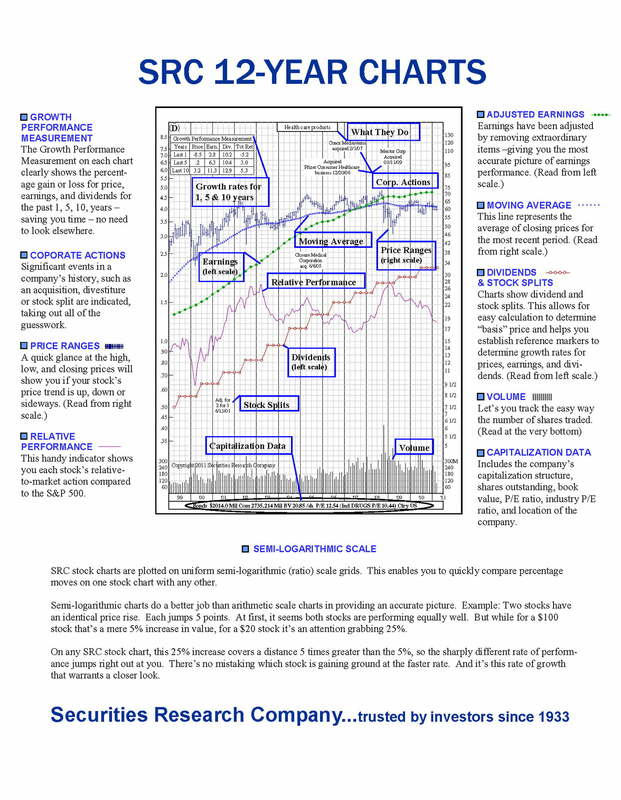 This is to say, these charts contain a record of the prices, earnings, dividends, volume, and corporate actions (which are significant events in the life of a company). 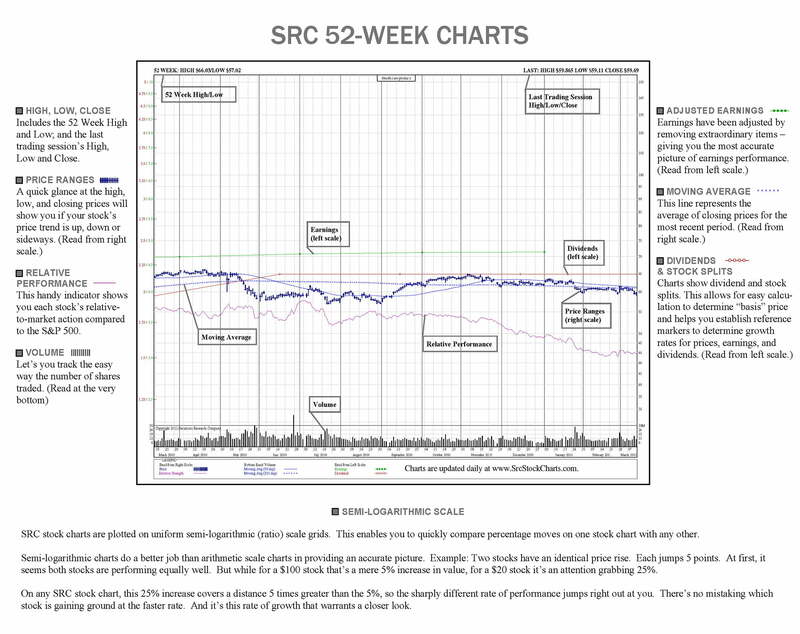 Stock Market Charts help you to make an informed decision of whether to buy or sell a stock of a certain company. 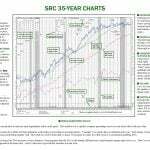 The price of these stocks keeps fluctuating and these Stock Market Charts inform you about the significance of these fluctuations and help you make an informed decision. 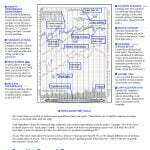 The question is – How to read these Stock Market Charts? 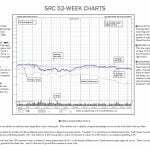 Securities Research Company is an investment research organization established in 1933 – and we’ve have done one thing very well: educating investors on the fundamentals for over 5,000 companies. 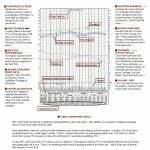 And tens of thousands of investors have relied on Securities Research Company for the accuracy and breadth of its data, presented in a very easy to use Stock Market Charts. Contact us now by submitting the inquiry form or contacting us on our toll-free helpline 1-800-921-3950. 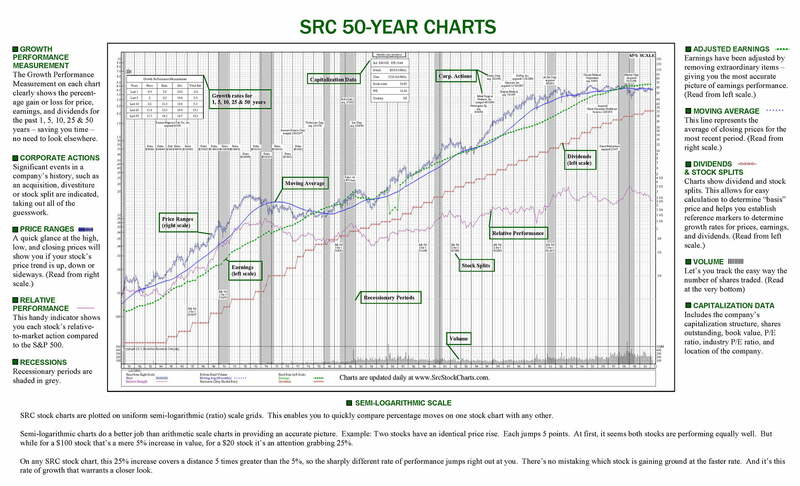 Reading Stock Market Charts might seem a bit complicated in the beginning but with a bit of learning and practice, your confidence in investing and spotting the right time to buy or sell a stock, increases. 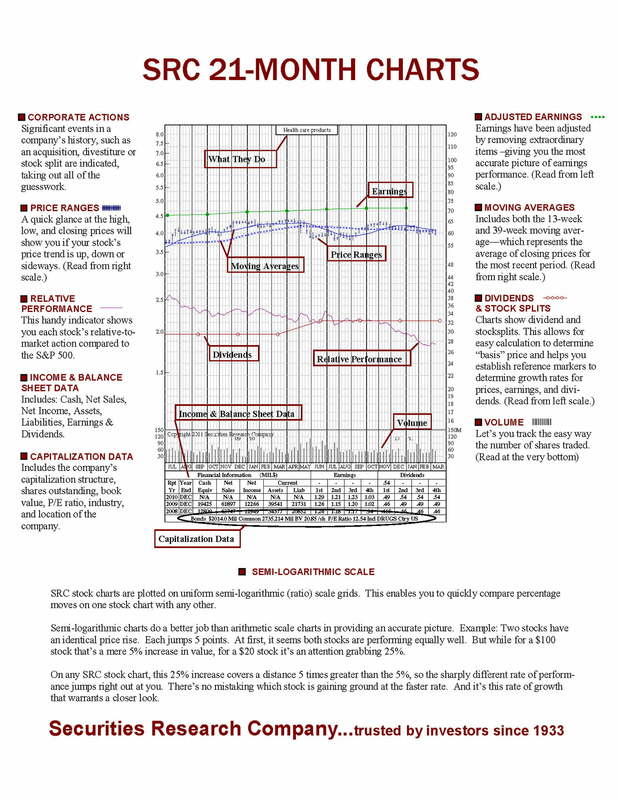 Here are a few things to look for while reading a Stock Market Chart. Read the price and recognize the volume or bulk of investors against it. Look for large fluctuations in the stock prices and spot if there is a definitive change in the volume of investors. If the large investors are holding on to the company, even after a large drop, it means that they trust the company and have hopes for it to rise up. Along with this, watch out if the company is holding on to its stocks or aggressively dumping them. As the name states, the moving averages line depicts the price of the stocks of a company over a certain period of time. This also helps in understanding if the bond between large stock investors and the company. Moving Averages helps you to spot the fluctuations in the price and volume of the stocks and thus, helping you make an informed decision. There are times when a company experiences bumps, spikes, or drops in the stock prices. The key to being a successful investor is to remain emotionally detached, but at the same time keeping yourself informed. 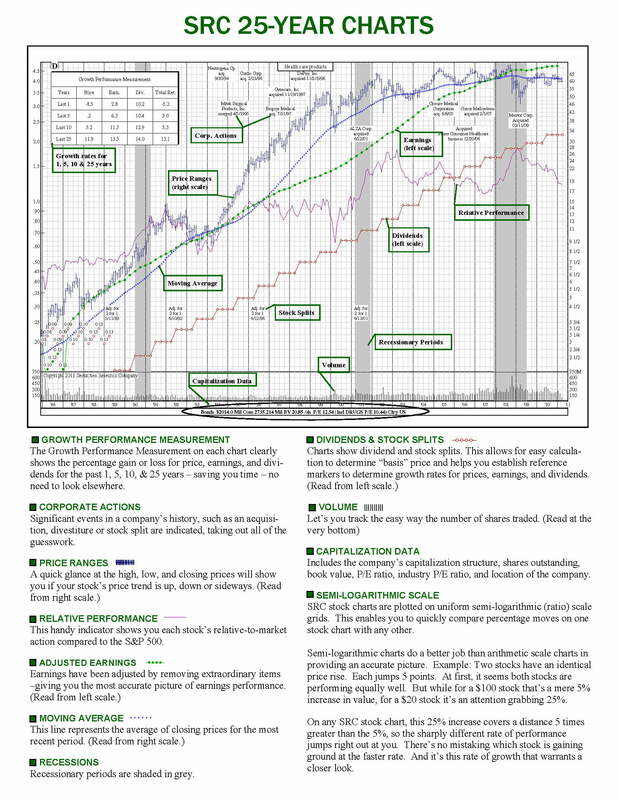 The trend lines on Securities Research Company’s Charts helps you to spot these fluctuations and match the retreat or perseverance of large investors. What is also key here is investing in companies with good management – because even in when the overall stock market falls, companies with good management are able to whether whatever storm is facing the economy as a whole or the stock market itself. You need to understand a company before investing in its stock. Investing without really understanding what you are investing in, is like gambling with your money – the odds are stacked against you. 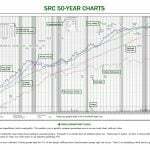 Securities Research Company can help you sift through the perpetual noise of the market and present you with just the important facts you need. Take your step towards a successful future in investment and make the call to Securities Research Company, now!